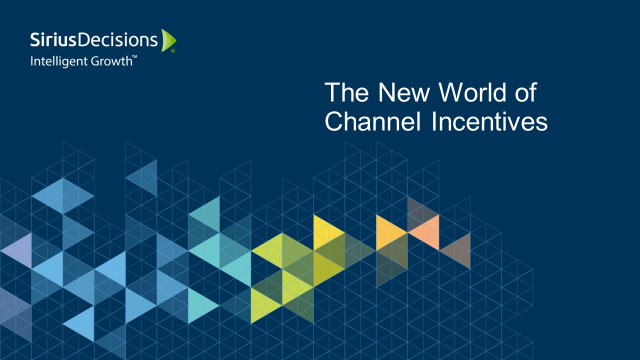 In this webinar, led by Kathy Contreras of SiriusDecisions, we will catch you up on the ever changing universe of channel incentives. Starting with MDF programs, we’ll identify the key challenges and highlight success criteria of traditional incentives. From there, we’ll delve into why it’s not just necessary, but imperative, that your incentive programs evolve beyond historical funding programs to the “new world” of channel incentives. In this webinar, we discuss why so many believe that partner experience is more important today than ever before in the universe of channel incentives. As 2017 gets moving, the incentive world seems to be changing daily. The new buyer’s journey, digital marketing, social media ROI, cloud-based partners, digital body language, new specialized channels – the channel world is in flux. The one thing that has not changed is the need for growth. And love it or hate it, MDF and partner enablement still play a significant role in these efforts. A little back to basics, along with a good measure of the latest trends seems like a good place to start the year. While the core elements of a successful MDF program haven’t changed much, the increasingly dynamic context in which they are viewed and the rapidly changing landscape of the buyer’s and seller’s journey make it necessary to continue to dig deep into the details of each step of even the most historically successful program. One thing everyone can agree on is that the “new buyer’s journey” is changing how customers buy everything from cars to firewalls. The traditional roles of sales and marketing are changing like never before. Add the complexity of selling through an indirect channel and things can start to feel pretty complicated. The good news is that there are practical approaches that help align channel marketing and sales to help smooth these seemingly troubled waters. A review of MDF fundamentals, packaged around the most relevant industry trends that we see driving the necessary adjustments for success. While the core elements of a successful MDF program haven’t changed much, the ever dynamic context in which they are viewed and the rapidly changing landscape of the buyer’s and seller’s journey make it necessary to continue to vet the details of each step of even the most historically successful program. In today’s rapid-fire market, the time has come for everyone in the channel to embrace digital marketing or suffer the consequences. It is no longer a question of whether or not to engage, but rather to what degree and how to execute. Tune in as Heather K. Margolis of Channel Maven Consulting and Steven Kellam of CCI lead a strategic discussion and offer real-world recommendations on how to drive partner engagement and success through digital marketing. CCI’s SVP of Sales and Marketing Steven Kellam was joined by PartnerPath’s CEO Diane Krakora to present the 2015 Channel Incentive Benchmark Study. They delved into the results of the study and its relevancy to channel vendor programs in the software, hardware, and telecommunications industries. Getting the funds you need to run and grow a channel organization can be a struggle. Often channel teams are the key path to much or all of a company’s revenue, yet are often woefully underfunded. You may a superstar at partner marketing or sales strategy, but why do you often hear ‘no’ in trying to fund what you know you need to be successful? The good news is you don’t need to be a financial or legal expert to run and grow a program. But you do need to understand what to pay attention to, and how to measure it, and how to talk about it with the rest of the company. The one constant in the channel is that it’s always changing. Being in the channel space for over 30 years, we’ve seen many programs evolve and grow with time. But just as often we’ve seen programs fail to keep up with technology and their business realities. Discover which channel practices are becoming obsolete and learn what you need to do to adapt and succeed. Well structured joint marketing planning (JMP) is crucial in maximizing partner sales and loyalty. But for most vendors, effective JMP hasn’t been easy to execute. Often done ad hoc and tracked on spreadsheets, joint planning can be an inefficient, time consuming ‘black hole’ with little accountability or visibility into results. In this webinar you'll learn about the innovative joint marketing planning approaches being used by the world’s top tech and telecom players. CCI’s Steven Kellam and Peter Hornberger were joined by Scott England from Zift Solutions to share the emerging footprint of what a global channel automation solution looks like. They will demonstrate how systems for partner marketing and engagement, fully integrated with comprehensive tools for joint partner planning, team coordination, and incentives management, can offer vendors the ‘holy grail’ of complete channel automation that is affordable and configurable. Long considered the ‘holy grail’ of channel management, connecting the dots between channel investment and sales ROI is still a struggle for even the most savvy and well-funded channel organizations. But in the last couple of years, technological steps forward in workflow automation, data integration, analytics, forecasting, and marketing automation have set the stage for a true closed loop. This evolution means finally being able to measure with certainty what efforts are working and which are a waste of time and energy, thus maximizing impact with limited budget. But the effect of connecting these dots has another, equally important benefit: each step in the channel planning, execution, and measurement lifecycle becomes dramatically more effective and efficient when influenced by the information captured in the other steps. MDF and Co-op programs are a two-edged sword for most channel leaders; they tend to be the lifeblood of channel partner engagement, but can be a headache to manage and measure. Today more than ever, how channel sales and marketing leaders approach MDF and Co-op can literally mean the difference between consistent double-digit growth and corporate decline. With all the changes happening in tech and telecom channels, it’s now more vital than ever to be smart, efficient, and effective at aligning, engaging, and strategizing with key partners in your channel ecosystem. But how do you do this in a way that is measurable and effective without forcing your PAMs to work 14- hour shifts? On January 30, CCI’s SVP Steven Kellam will be joined by PartnerPath CEO Diane Krakora and CCI’s Peter Hornberger to explain the keys to measurable, scalable joint partner planning JPP success, and look at some tools that can help introduce discipline, efficiency, and accountability to the process. With shrinking or static budgets and increasingly aggressive revenue targets, channel managers’ success increasingly hinges on achieving, and proving, maximum return for your partner program investments. • How many of us are adequately measuring the true value add of each partner? • Have you ever had a queasy feeling that you’re paying out too many financial incentives to partners for doing things that they probably would have done anyway? • How do you differentiate the proactive partners from the passive ‘order takers’ milking cozy relationships with your sales team? • And how do you best measure who is on track to make you the most money over the next ten years instead of the last ten years? On October 29th, CCI’s Steven Kellam will be joined by PartnerPath CEO Diane Krakora, who advises many of the world’s top channel organizations on best practices and growth strategies. They will explore the evolving science of partner scorecarding. • Learn the process needed to achieve a scorecarding approach that is representative of your company’s unique aspects, not someone else’s. • Learn easy-to-utilize techniques and metrics that reveal who is most actively engaged in your business, investing in it, finding new opportunities, and positioning you for future success. The ever-increasing pressure on channel leaders to demonstrate measurable ROI for their investments, combined with a sea change in technology revenue models, has brought about a resurgence in popularity of SPIF and rebate campaigns. But while SPIF programs can be especially effective for influencing behavior because they directly target the sales rep “where the rubber meets the road,” many companies implement SPIFs in a knee-jerk reaction to the need to “sell now!” and then are disappointed with the results. • Why SPIF and Rebate programs are so popular in today’s tech channel environment. • New techniques and technologies being used to make SPIF and Rebate campaigns more engaging and effective. • How to avoid many common pitfalls in SPIF campaign execution. • What to look for in SPIF campaign management tools. • When to use “soft” rewards as opposed to cash rewards. • How to get better reporting and metrics around your SPIF programs. The explosion of cloud technology is dramatically changing rules for how best to manage, engage, and motivate our resellers and distributors. How we and our channels evolve through the next few years will be a critical for success. - Reward progress toward success in selling cloud. When was the last time you took a hard look at your Co-op/MDF/JMF program? When was the last time your guidelines were updated? While joint marketing programs often represent a high dollar spend, many companies leave their programs on auto-pilot year after year, leaving millions on the table in missed opportunity. • Learn the 8 key program variables to consider in maximizing program effectiveness and controlling waste. • Review best practices for determining and aligning program objectives. • Learn how to more quickly recognize trends and opportunities in thru-partner marketing support. • Gain a variety of tips, tricks, and trends to set you up for more targeted and successful joint marketing programs. • Learn common mistakes channel leaders often make in MDF/Co-op program execution, and how to avoid them. Don't miss this opportunity to learn valuable best practices that will immediately help you improve the performance of your program. This webinar is ideal for anyone in channel management, sales, marketing, or sales operations who is looking to improve program effectiveness. How are incentive programs perceived by channel partners? How does your incentive strategy stack up? CCI recently surveyed a broad group of channel marketers, benchmarking current and planned channel incentive strategies. The study covered all areas of channel incentives offered by global channel marketers, including: Co-op/MDF, sales performance rebates, SPIFs, opportunity management, purchase incentives, and more. Additionally, CCI surveyed resellers to get their point of view on the programs offered to them, their perceived effectiveness, and how they’d like to be supported and incentivized going forward. This informative hour will cover the findings of both surveys and provide comparisons between what marketers consider important and what partners are saying they need. The results will surprise you! CCI provides the channel expertise and technology top companies need to create and manage global incentive programs that motivate their partners, simplify channel management, and significantly impact their bottom line. CCI helps many of the most successful companies in the world - including Autodesk, Avaya, Brocade, Emerson, Blue Coat, Motorola, Siemens, Sony, Verizon, Xerox and more – turn their channel programs into a key competitive advantage. Founded in 1983, CCI is based in the San Francisco Bay Area, with sales and client management offices worldwide.